Tonight's demo is on a very easy and handy tool to make. This is a spring fuller tool I designed for someone to make that has no welding equipment. It also does not need a heavy piece for a shank and can be easily adjusted to different sized hardie holes. This is our 159th iForge demo. Click for Detail This is a very simple tool. 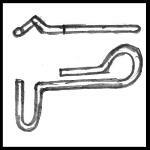 It can be made of 3/8" to 9/16" (~9mm to 15mm) round bar depending on the size of your hardy hole. Bar up to 1/2 the size of your hardy hole will always work. Check the fit of larger bar. You can use mild steel or spring steel for this tool. Spring steel will not get sprung out of shape as easy as mild steel and will hold up a little better. But it is not a necessity. Click for Detail The trick to this tool is the diagonal fit in the hardy hole. This gives you similar stability as a solid shank but is easily adjustable. Click for Detail Make your first bend about 10 to 12 inches from the end of the bar. Then make the "U" shape to fit the hardy hole. Then make the third bend in the hardy hole to match the first. 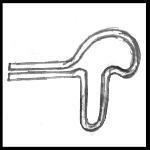 The spring loop can be made on a bending jig or free hand on the horn of the anvil. It is easiest to make the entire tool on one plane (flat) then but the offsets in to align it to the long axis of the anvil. My apprentice made this one in a little NC Whisper baby. 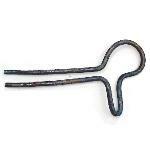 It can easily be made using a small coal forge or a torch. Click for Detail If you are bending with a torch and have sharp edges on your hardy hole it will help to make reliefs as shown in the corners here. Click for Detail This final drawing shows another version of this tool with one less bend that might be easier for some folks to make. It needs to have a snug fit in the hardy hole so that it does not pop out when used. 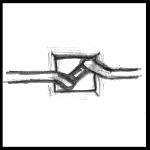 On fullers made of heavier bar such as 1/2" or 9/16" OR spring steel the spring loop can be flattened a little to make it less stiff. On the larger bar you can also shape the work area so that it is parabolic or triangular in section for various purposes. See demo #88 for various shapes. Jock, I have some 11 ga 1" square that is too small to fit properly in the 29mm hardy on the Russian anvils. Using your concept, could I pound the square into a diamond to fit into the corners to use it for hardy tools? QC, I don't see why not. It would seem easier to to use some kind of shims. Jock, Never thought of using the diagonal like that. Slick engineering, bud! I think the diagonal fit was Whitesmith's or Ntech's idea. I just applied it to one long bar without welds. Yep, more food for thought. Neat idea. 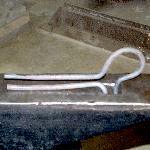 QC, the bent U bar idea in the demo could be applied to a welded shank. Just weld one side you can adjust the fit. A springy fit would be about as steady as you can get. But not as sturdy as a solid shank.